Beltex females met a strong demand peaking at 3,000gns at the breed society’s premier show and sale at Carlisle on Friday 7 December. Top price of the day was the first prize ewe lamb, Woodies Smarty Pants, which sold for 3,000gns to George Cropper. Stuart Wood, Inverurie, Aberdeenshire headed the day’s trade with 17 lots amongst the top prices to average £1,022 including the 3,000gns leader. First prize winner Woodies Smarty Pants, a ewe lamb by Glantre Norris and out of Woodies Natasha, was full sister to the 6,200gns Woodies Rice Crispie and purchased by G Cropper, Baxenden, Lancashire. The same buyer paid 900gns for a Woodies shearling gimmer in-lamb with a same way bred embryo. Stuart Wood secured the day’s second top call of 1,600gns for the shearling gimmer Woodies Rebecca by Norris and out of a homebred ewe. She was purchased by N and K Forshaw, Preston, Lancashire, who also bid 1,000gns for Lugate Rose, another shearling gimmer from Stuart Wood. This one was by Brickrow Porter and out of Artnagullion Hope and Glory. A call of 1,300gns was made for the ewe lamb Woodies Sound as a Pet consigned by the same breeder. This one was sired by Kingledores Ramises and out of a homebred ewe to go home with M Munro, Lairg, Sutherland. This buyer went on to pay 600gns for Woodies Super Duper, a ewe lamb by Drumchapel Replay and out of a homebred ewe from the same flock. Stuart Wood then sold the ewe lamb Woodies Star, by Woodies Pheunominal and out of Lugate Polly, to A and J Campbell, Newton Stewart, Wigtownshire, for a call of 1,050gns. 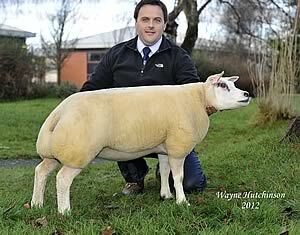 The Campbells also invested 1,000gns in Woodies Superwoman, a ewe lamb by Ainstable Poland and out of Lugate Lilly. The three year old ewe and overall champion Nursery Nat from Stuart Wood sold for 900gns to M Owens, Ceredigion, Dyfed. Bred by A Denning, Tonbrisge, Kent, this one was by Lamberhurst Kelsey and out of Nursery Lilly. An imported shearling gimmer from the Woodies flock sold for 700gns to G and K Williams, Lampeter, Ceredigion. Next at 700gns was Woodies Sienna to R Brown, Black Isle, Ross and Cromarty. This ewe lamb was by Ballydown Magnus and out of Northcop Lima. The same buyer bid 650gns for a two year old ewe consigned by Stuart Wood. Bred by Richard Wood, Biggar, Lanarkshire, Kingledores Petra was by Viagrow V/d Drie Musschen and out of Kingledores Madonna. Sticking with the Woodies flock, Mr Brown paid the same price for an imported shearling gimmer. Another shearling gimmer from Stuart Wood sold for 650gns to C L Wylie and Son, Kirriemuir, Angus, implanted with an embryo by Kingledores Ramises and out of Woodies Northern Rose. Stuart Wood went on to sell a three year old aged ewe for 600gns. Corra Nicolette by Van‘t Ophoverveld King Kong and out of Van De Bieshuvel, was purchased by R L Prouse, Bude, Cornwall. Realising the same bid was a Woodies shearling gimmer implanted with an embryo by Kingledores Rascal and out of Heatheryhall Mary, sold to C Mitton, Clitheroe, Lancashire. The shearling gimmer Horseclose Red Hot was sold for 1,100gns. Bred by J A McGarva, Annan, Dumfriesshire, she was by Corstane Max and out of a homebred ewe and knocked down sold to D and L E Gregory, Launceston, Cornwall. At 700gns, Mr McGarva offered another shearling gimmer, Horseclose Regina, by Horseclose Power House and out of a homebred ewe went home with I Davidson, Lockerbie, Dumfriesshire. Recuperating some of the cost of his top lot buy, Mr Cropper sold the shearling gimmer Hudhey Rising Star for 1,050gns. This one sired by Northern Beltex and out of Brickrow Midnight Million was secured by A Morton, Denny, Stirlingshire. The ewe lamb Fowrass Smartarse came next at 980gns selling to A Jones, Talsarnau, Gwynedd. Consigned by J Carlile, Penrith, Cumbria, she was by Beachy Rabbie Burns and out of Clary Perky. A call of 900gns was made for Kingledores Saphire bred by Richard Wood. Purchased by M Burleigh, Enniskillen, County Fermanagh, this ewe lamb was by Clary Prankster and out of a homebred ewe. Sold for 800gns and entered from the same consignment was the reserve champion Kingledores Ray, by Cookstown Mr 11th and out of Artnagullion Kash. This shearling gimmer sold to R Gregor, Inverurie, Aberdeenshire. The same buyer paid 700gns for Airyolland Lakshmi, a five year old aged ewe from N and J McQuistin, Newton Stewart, Wigtownshire. She was by Airyolland Great Scott and out of a homebred ewe. Woodies Starshine, a ewe lamb from Stuart Wood’s flock by Ballydown Magnus out of Beachy Phoenix also went home with Mr Gregor for 650gns. Langlands Rapture was knocked down sold at 700gns. Bred by J and S Wilkinson, Richmond, North Yorkshire, this shearling gimmer by Dooley Napal and out of a homebred ewe was secured by C Mair and Partners, Turiff, Aberdeenshire. Richard Wood took a bid of 650gns for shearling gimmer Kingledores Raja. This one by Cookstown Mr 11th and out of Artnagullion Kash sold to C Mair and Partners, Turiff, Aberdeenshire. Kevin and Rachel Buckle, Barras, Kirkby Stephen sold a shearling gimmer to Messrs McQuistin for 650gns. This one was implanted with an embryo by Broxty Supreme and out of Joconde Du Chene. The Buckles also took 620gns for a two year old ewe, Buckles Pine Martin by Newton Leo and out of a homebred dam, and secured by M E and D M Boustead, Kirkby Stephen, Cumbria. The shearling gimmer Brickrow Red Cola also sold for 620gns. Bred by J W Cowan, Ayr, Ayrshire, this one by Burnside Phenomenon and out of Lisnacrann, was purchased by K I and J Brunskill, Kirkby Stephen, Cumbria. The shearling gimmer Ainstable Randy sold for 600gns. By Clary Nithsdale and out of a homebred ewe, she sold to D and D Aitken, Lockerbie, Dumfriesshire and was bred by B Hall, Carlisle, Cumbria. Also at 600gns was Headlind Riff-Raff, a shearling gimmer from A Jackson, Lanark, Lanarkshire. By The Drifter and out of a homebred ewe she sold to A Sutherland, Halkirk, Caithness. Averages: 28 aged ewes, £391.13; 78 shearlings, £462.13; 22 ewe lambs, £870.54.